There are a lot of economic writers who won’t tell you when something moves against their thesis. Those guys trumpeting a flatlining of commercial and industrial growth last year? They never heard of it this year (hint: because it’s up!). To the contrary, one of the reasons I do my Weekly Indicators piece is that it forces me to mark my forecasts to market each week. If a forecast doesn’t work out, I want to undertake a post mortem and understand why. I certainly don’t have to do that today, but yesterday one piece of evidence did move against my thesis of a slowdown next year: ISM new orders for November. As I reiterated in today’s piece at Seeking Alpha on yesterday’s yield curve inversion, the long leading indicators have pretty much been deteriorating all year long, to the point where for the last three weeks they have been negative. So there is simply a lot of evidence to suspect that the economy is going to follow suit after a year or so. In the meantime, I’ve started to focus on whether the short leading indicators are also beginning to show signs of weakness. One such measure is manufacturers’ new orders. On a semi-weekly basis, I track that via the regional Fed indexes. 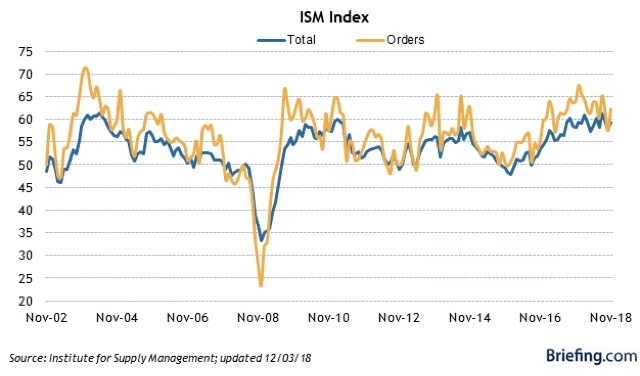 On a monthly basis, the ISM new orders index is the go-to metric. Yesterday’s reading was about average from earlier this year. So, fair is fair. Yesterday’s ISM report is contra my thesis. On the other hand, the general trend over the last few months has been a gradual backing off from extremely strong growth seen at the beginning of this year. It is badly over weighted to energy and indeed, that will fall back next month no matter what.